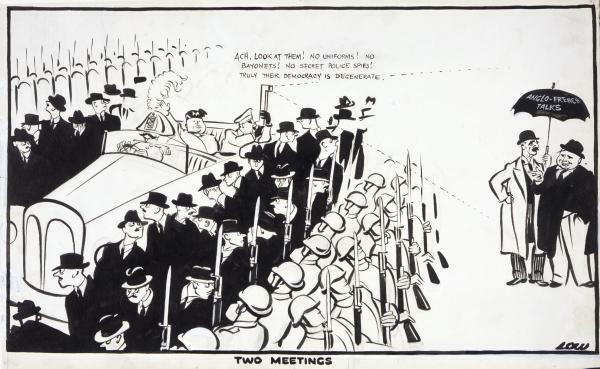 This 1938 David Low cartoon for the London Evening Standard contrasts the fascist dictators Hitler and Mussolini with the prime ministers of Britain and France. Hitler and Mussolini are surrounded by secret police and military, while Neville Chamberlain of Britain and Edouard Daladier of France shelter under the flimsy umbrella of 'Anglo-French talks'. Low, a New Zealander, achieved fame in Britain for his political cartoons, particularly his anti-fascist work of the 1930s and 1940s. Hitler was reported to be so incensed by Low's cartoons that he placed the cartoonist on the Nazi death list.